Making a new church website? Wondering if the site you have is good enough? Use this site to get non-technical, jargon-free help and advice. Advice about the different subjects which church websites typically cover. 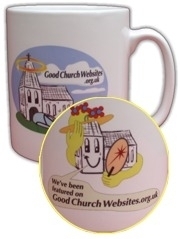 We will award one of these wonderful mugs to the managers of all the church websites we feature in our Good Examples section. And we hope others will find the examples are a help when improving their own church websites.